Take advantage of current sale pricing on our premium artificial Christmas trees. While the hustle and bustle of the holidays is always exciting, all the presents, feasts, and events can monopolize budgets at this time of year. But the cost of an heirloom quality Christmas tree is one less thing to worry about! With our seasonal sales, you can own a beautiful Balsam Hill artificial Christmas tree at a price you can afford. Featuring soft needles, dense branches, and expertly strung Christmas lights, any of our artificial Christmas trees that are on sale will create a picture-perfect holiday display right in your living room. 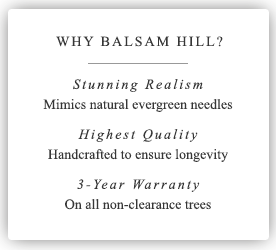 These trees offer all the quality and convenience you’ve come to expect from Balsam Hill, at the best prices of the season. Whether you are searching for a classic unlit tree with traditional style artificial branches, or something pre-lit with our most realistic branches, there are plenty of options that are on sale right now! Ranging in size from Christmas trees under 180 cm to sizable models towering over 365 cm high, we provide an impressive selection of sale trees to choose from. Be sure to also look for trees with our specialized Easy Plug lighting system that makes lighting your tree as simple as plugging it in. Most of our sale styles are currently discounted for temporary sales and will be available all season long (though these prices won’t last). So if a tree you love is out of stock, don’t fret! You can always snag it once it is back in stock. However, if you’re looking for even deeper discounts, be sure to also take a look at our selection of discontinued Christmas trees, wreaths, and more in our clearance section!